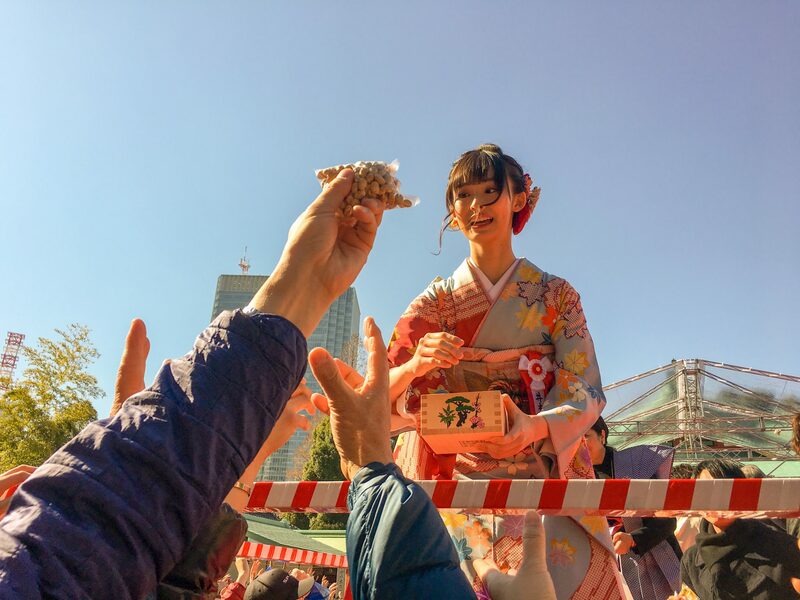 On better place to be in the World’s Greatest Metropolis than join the locals to celebrate Setsubun with some traditional mamemaki bean throwing. That’s exactly what Mac, our Founder and Lead Guide was doing with his guests on their fully-customised Tokyo Private Tour. Learn more about this fun ritual and watch our exclusive videos of two of the city’s major Setsubun events right here! Setsubun (節分) is the day before the beginning of spring in Japan and is celebrated annually on 3 February as part of the Spring Festival. In the past it was thought of as a sort of New Year’s Eve (much more than is is now). The new year was considered a time when the spirit world and the physical world came close together. A special ritual called mamemaki (豆撒き) is performed to cleanse away all the evil of the former year and to drive away any wandering spirits that might happen too close to one’s home. This involved the throwing of roasted beans around one’s house but now, possibly given that most Tokyoites live in apartments, many people visit temples and shrines across the country and take part in ceremonies where we try to catch beans thrown by shrine officials and often politicians, sumo wrestlers and celebrities. When throwing the beans, you are supposed to shout “Oni wa soto! Fuku wa uchi!” (“Devils out, fortune in”). Afterwards you should pick up and eat the number of beans which corresponds to your current age. Many shrine and temples held their main Setsubun festival in Tokyo today, and our guests got to enjoy two of them. After enjoying this incredible spectacle it was time for lunch, and what better than to enjoy a traditional ehomaki. Originally a Kansai custom, in recent years the act of eating a roll with auspicious ingredients while facing this years lucky direction has become popular across the country. (East-North-East is this year’s direction). A great day was completed with some delicious local ramen. Thank you as always to our guests for choosing Maction Planet! If you enjoyed our videos then please subscribe to the Maction Planet YouTube Channel for more from the World’s Greatest Metropolis, and beyond!